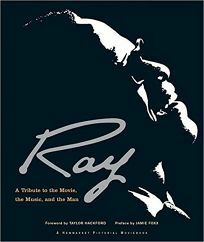 This handsome book is as much an homage to musical genius Ray Charles as it is a behind-the-scenes look at how a film was made about his life. Although the bulk of the text is made up of the film's screenplay, it's the accompanying images of Charles and of Jamie Foxx (who plays Charles in the film), as well as the insightful essays (by Foxx, director Taylor Hackford, music supervisor Curt Sobel, producer Stuart Benjamin and others), that make up the book's best parts. Some spreads juxtapose separate--yet eerily similar--photos of Charles and Foxx; others, taken prior to Charles's June 2004 death, show the two artists laughing together. The informative articles explain various aspects of the filmmaking process (e.g., how the filmmakers made prosthetics for Foxx to wear over his eyes so that he could experience blindness). Other pieces discuss how the filmmakers depicted such aspects of Charles's life as the tiny, ""ultra poor enclave"" he grew up in; the trauma of watching his four-year-old brother drown in a washtub; his bold departure from his hometown when he was only 17 (and blind); his struggle with heroin addiction; and his groundbreaking, controversial fusing of blues with gospel music. 204 color photos.